I have been dyeing fine merino wool and have been making tubular scarves and shibori dyed shawls and wraps. I am just discovering what the wool dyes can do. If I heat the pot too fast, the dye takes very quickly and unevenly. I really like the effects but some people might see this as a negative and call it 'tie dye' rather than 'shibori'. The wool retains a bit of shape from the resist method (shibori is 3D, rather than flat). I'm also trying to work out a good way to finish the edges of the shawls. So far I have tried using the overlocker, attaching a binding as for quilting, adding an edging of organza and just leaving the edges to curl. I actually prefer the naturally curled edges but am worried that some potential buyers might think they aren't finished. I have never really dyed wool before. I have played around with dyeing skeins of my own handspun wool when I lived in Australia but haven't used Acid dyes up to now, but they are terribly easy to use and only need household vinegar as an additive so are a bit safer than cotton dyes which use soda ash. They also 'exhaust' so washing at the end is easier as you don't have to rinse and rinse and rinse as for Fibre reactive dyes on cotton (Procion). I will put some photos of the finished scarves on here when I find my camera. I am writing my websearch article for New Zealand Quilter and saw someone else call themselves the slow blogger. It applies to me too. I forgot I had a blog. Since I last posted I have learned a really cool skill. 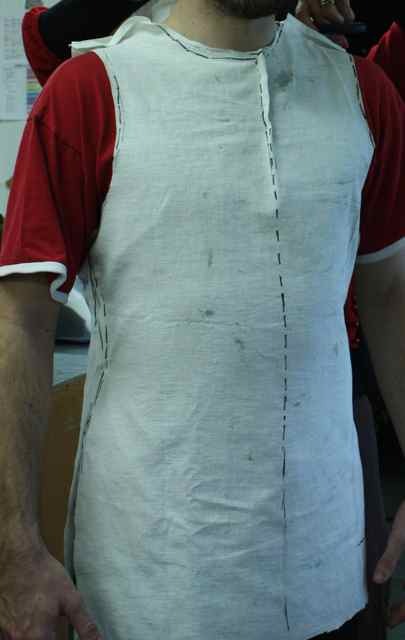 The whole textile class at Whitireia learned how to make a toile to fit their own body using a method outlined in the book 'The Medieval Tailors Assistant'. Each person took 2 pieces of calico and then someone else pinned them into it, over the shoulders and along the sides. Then the excess fabric was cut off and further pinning was done. Yes they are two different people! 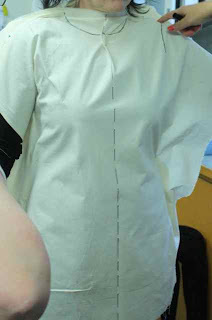 After it was as close fitting as possible, it was cut down the dotted line in the middle and made into a pattern. 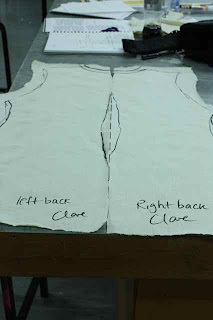 A toile was made from the pattern which was adjusted again, then clothes can be cut using that as the basic pattern. I made a tunic which fit perfectly (except for the armholes which are a bit tight and which I need to adjust again). I have discovered I have very sloping shoulders. I can also see why commercial patterns don't work for me - darts end up in the wrong place, shoulders too wide etc. It was good fun and a great 'team building' exercise. Now to make some clothes that fit! Whilst I am procrastinating about completing the Websearch article, I am going to mention a website I found while looking for wool quilts. Rebekah Farr lives in Carterton. She has made 4 wool quilts which is how the search found her site but she is an animator and painter. Her 4 minute animated movie is called Real World and her paintings are lovely too.